Pandora, a personalised radio service that plays music and comedy, is now available for Windows Phone. As an exclusive promotion Pandora, when used on Windows Phone, will be ad-free and have no monthly streaming limits. Pandora usually charges a $3.99 per month subscription (or $36 a year) for ad-free listening and limits free mobile listening to 40 hours per month, but there will no charge or limits for Windows Phone users throughout 2013. 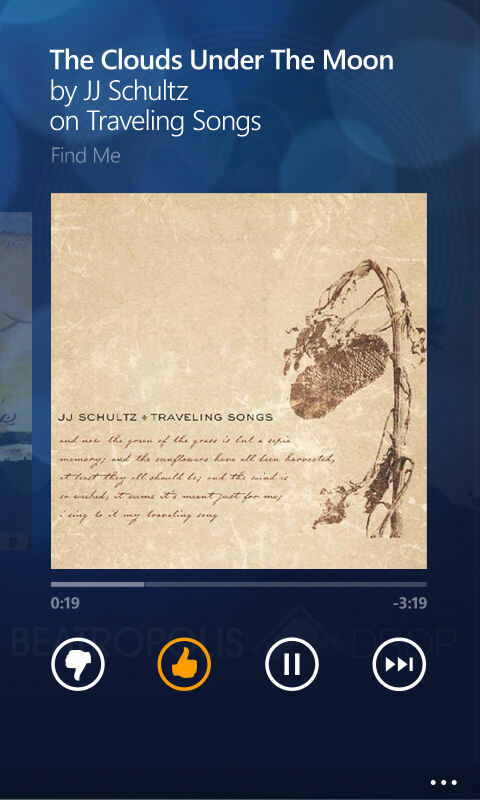 Like other streaming radio services Pandora provides a number of pre-defined stations (e.g. country, dance, classical, comedy), but you can also create your own station (up to 100) by specifying the name of your favourite artists, songs, comedians, or composers. The service will generate a station (playlist) based on your specification. While listening to songs users are encouraged to provide positive or negative feedback (thumbs up or down), which is taken into account when Pandora selects future songs. In this way your radio stations become more personalised to your tastes over time. The arrival of this high profile app is the result of a partnership between Microsoft and Pandora. As a result there are a number of Windows Phone exclusive features. In addition to the ad-free listening and no streaming limits period there is Live Tile integration (pin favourite stations to the Start screen, and see what song is currently playing), Xbox Music integration (buy tracks and albums), and Kid's Corner integration (when launched from Kid's Corner explicit content is automatically filtered). Pandora is a significant addition to the Windows Phone app catalogue because it's a well known app and service on other mobile platforms. In July of 2012 Pandora announced that it had 54.9 million user, a number that continues to grow. Like Instagram, it has sometimes been cited as a reason not to switch to Windows Phone. Aside from first mover advantage, one of the reasons Pandora is popular is that its personalisation features and music selection algorithms are particularly strong. When "choosing" which song to play next in a stream Pandora takes into account more than 400 different musical attributes (which are themselves combined into more than 2000 focus trait groupings). As a result Pandora is able to create automatically create play lists that can be mistaken for human-curated play lists. Or, put more simply, it plays good music. Windows Phone brings you the Pandora you love and gives it a unique Windows Phone twist, allowing you to pin your favorite stations to the Start screen, or see what’s playing by glancing at your Pandora Live Tile. Take your favorite personalized radio service to a whole new level with Windows Phone! Pandora is free, personalized radio that plays the music and comedy you’ll love. Just start with the name of one of your favorite artists, songs, comedians, or composers, and Pandora will create a custom station that plays similar tracks. Create up to 100 stations, and easily switch between favorites. Pandora features hundreds of music and comedy genre stations ranging from Dubstep to Smooth Jazz to Power Workout. In the car, at the gym, on the train – listen wherever and whenever you’re in the mood for great music. Already a Pandora listener? It’s simple. Just log in. Enjoy all your existing stations - and create new ones right from your phone. 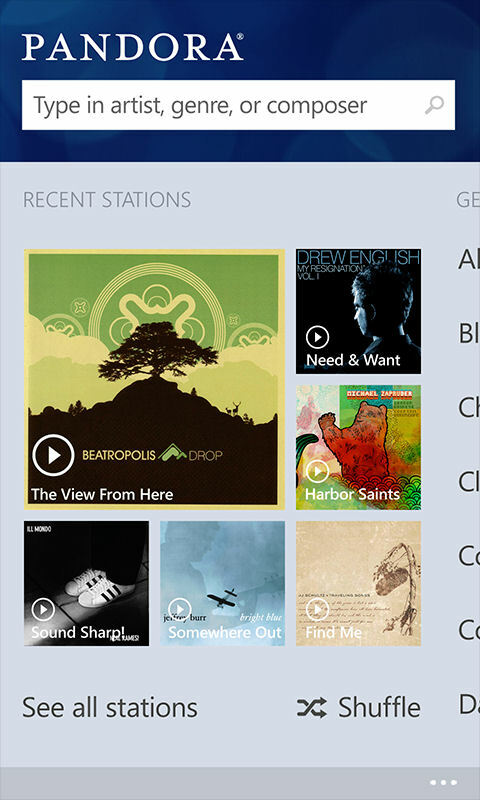 Pandora is a free download from the Windows Phone Store. It is only available in the USA, Australia, and New Zealand due to music licensing restrictions and is currently only available for Windows Phone 8. For those outside the supported countries Nokia Music provides a similar free service in a number of markets (and also has offline support). There are also other 3rd party music radio streaming apps available in the Windows Phone Store (e.g. AUPEO, 8tracks).